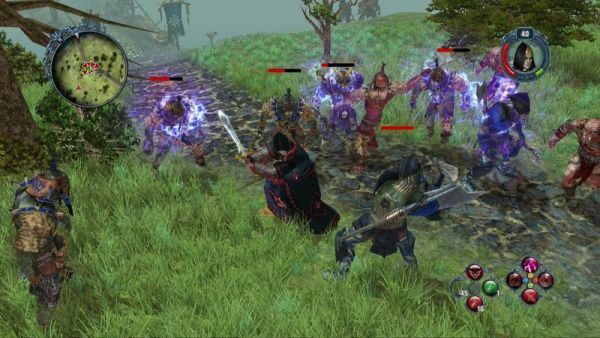 Sacred 2: Fallen Angel is a hack and slash action RPG hybrid, Diablo-style. Six character classes are included, along with two campaigns, one good and one evil. Replayability is through the roof in this game. If you are a fan of customization, you are in for a treat. Each character can be altered and tweaked to fit your liking in dozens of different ways. Not only are there a multitude of different weapons, skills, and abilities to choose from, but each one is further customizable. Runes, relics, and more contribute to the mix, and to be honest, it can be overwhelming. It's a bit like giving a new cell phone with all the bells and whistles to your tech-challenged grandfather; the device can do so much, it takes a while before he'll actually learn to use the phone's basic functions. Unfortunately, there is no in game tutorial to help you learn all of this, and the manual is unhelpful as well. There are plenty of resources online, but I'd have appreciated an easier learning curve. Not much as changed in the terms of content for Sacred 2: Fallen Angel between the PC version from last year and this year's PlayStation 3 and Xbox 360 versions. We recommend checking out our PC review to look at some of the more intricate details of the game's world and gameplay. In terms of controls, the console version works well enough by mapping skills and attacks to the face buttons of the controller. The left and right triggers give modifers to these allowing for a total of 12 different slots to do your bidding. The D-Pad is mapped to potions for quick healing, mana, and other items. Attacking is as simple as holding down the button and pointing the analog stick towards and enemy. It's a bit different than clicking a mouse constantly, but it works. 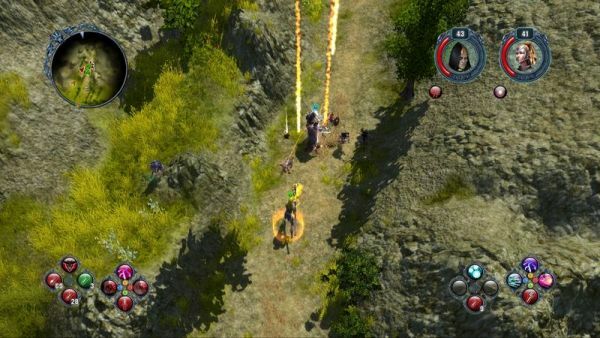 Sacred 2 allows for four player co-op online. You and three friends can drop in and out of games, with only a minor amount of hassle. The console versions allow local co-op, where you and a couch co-op partner can play together on one system. My son, with his silver Live account, was able to join me locally with no problems. Best of all, two local players can join up to two online players. To do so, both gamertags must be Live enabled; a second local player can sign in as a guest, but their progress cannot be saved. (This obviously doesn't apply to the PS3 version.) I found this quite disappointing, though it's pretty much the standard in similar games. Local co-op is a great addition, but there are a few nagging problems in Sacred 2 that mar the otherwise enjoyable experience. One such flaw is the camera. The view is zoomed out incredibly high overhead, no matter how close you are to you partner. The game is certainly playable in bird's eye view, but you miss all of the eye candy, and important details can be hard to see. I'd have liked to have seen an automatic zoom, particularly in dungeons, where players will generally be close to one another. Another issue is that only one player can manipulate menus at a time. In a game where you are constantly trying new slots, using runes, scrapping excess junk, etc. there is a lot of waiting around for your partner to finish. Having two menus up at once would get you both back into the action twice as fast. There is one problem with local co-op that, to be frank, is almost a deal breaker. You cannot trade items with a local partner. Unbelievable as it may sound, if your high elf picks up a wicked set of wings that would be perfect for your buddy's Seraphim, there's no way to trade them. You can store items in your own hero chest, which is available to any of the characters from your gamertag , but your local friend is out of luck. Not allowing trading of items is a baffling design decision, and I can only assume that it is in place to dissuade cheating or exploiting somehow. The only workaround is to trade items to an online friend, who can trade them back to anyone. For the most part, I'd say it isn't worth the trouble. This is easily the biggest flaw of the console version of Sacred 2. Page created in 0.3948 seconds.